I’m a big believer in hand-written thank you cards. I think it’s a nice way to show someone how much you appreciate what they’ve done for you – much more personal than an email or text. I love to both give and receive hand-written notes in the mail. The Thank You Cards Shop was made for people like me. From photo cards to traditional thank you notes, there’s something for everyone and every occasion. 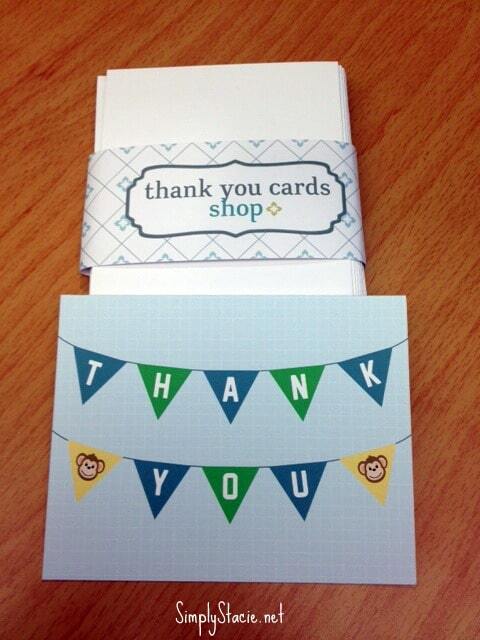 The Thank You Cards Shop was started by Amy Lowry – a graphic designer with a passion for designing stationery. The shop offers a variety of styles to meet the needs of everyone from newlyweds looking for that personal touch for their wedding thank you cards to new parents looking for a unique design for their baby shower thank you notes. There are options to personalize stationery as well as add photos to thank you cards. Amy even has a section of her site dedicated on how to write the perfect thank you note. Since I am constantly writing thank you notes on behalf of my two sons, I chose two simple designs for review and am impressed by both. For my three-year-old I chose the Green Bunting Stationery card with little monkeys – a fun card that really fits in with the personality of my Matthew! For my 9-month-old I chose the playful Going Fishing cards. Printed on high-quality paper, these cards are perfect for my any-occasion thank you needs. I always like to keep a stash of notes handy because you never know when an occasion to write a thank you note is going to pop up! You can see the selection of cards and stationery on The Thank You Cards Shop website, as well as keep up with them on Facebook and on their blog. Two lucky Simply Stacie readers will win a $25 shop credit to spend on the Thank You Cards Shop site. What a nice giveaway – you don’t see as many cards being sent these days and it’s a nice way to stand out. I like the green striped Thank You cards, would be good ones for a boy, even as he gets a bit older. I like the orange and pink Chevron Thank You cards. I love the Elephant and Balloons Thank Yous! Sooooo cute! I like doing handwritten thank you cards as well! I like the Family Owl thank you notes and the Kids Owls design, and the Birds design is also cute! 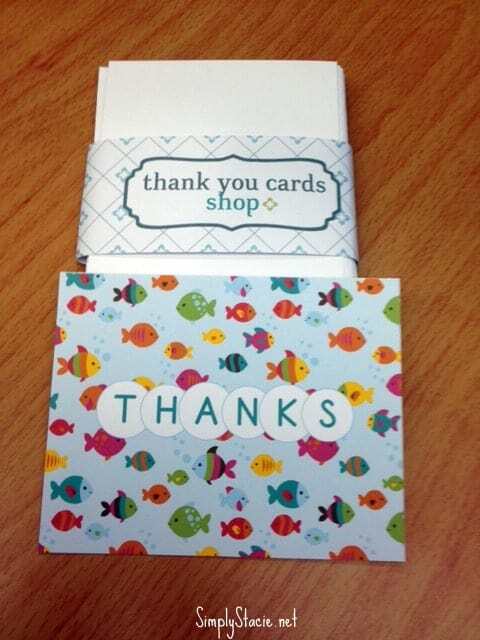 I like the green stripe photo card and the fishy one you reviewed. I love the Vintage Camera Thank You Notes. I like the Green Chevron thank you notes. kids thank you photo cards. I like the Going Fishing Cards and the photo kids cards. I love the Owl Kids Thank You Cards!! The Birds Thank you cards. So cute! I love the Green Striped Cards. Thank you fir the opportunity! Cute! I like the Fox Kids Thank You Cards. I’m in love with the Perched Bird Stationery! Lovely thank you notes.. I like the photo cards. the vintage camera ones – very cool! Anything from the Summer Brights Collection. Thanks for the giveaway! My favorite are the navy and green Chevron patterned cards. I love the blue floral thank you cards. Sweet. i love the Travel Thank You’s! Love the Kids Thank you Notes called Roses! I agree with you about handwritten notes! They are so much personal! I like the kids thank you photo cards. I love the Flowerburst Patterned Cards! I like the kids birds thank you notes.